I’m a sucker for easy, especially when it comes to food. It has to be delicious though, and made in my own kitchen. Bonus points for including as many vegetables as possible. Aren’t vegetables the best when you don’t even realize you’re eating them? Sure, I love roasted brussels and blackened peppers, but there’s something so satisfying about secret veggies. 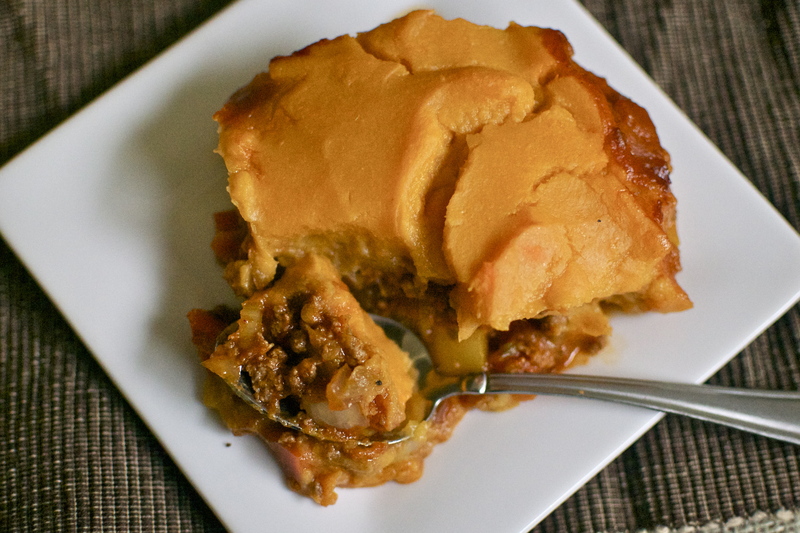 This mexi cottage pie, which is basically shepherds pie made with beef instead of lamb, is a go-to weekly meal around here. It makes A TON, lasts all week, and is incredibly delicious. It just so happens to be packed with 8 veggies (if you count green chiles and sweet potatoes (which of course I do)). Now that’s some serious secret veggie action. To all of the instagrammers requesting this recipe, thank you!! Thank you for getting me to share something I should have shared forever ago. Preheat oven to 350. In a large skillet brown the beef over medium high heat. I usually do mine in two batches. Once browned, set aside, reserving as much of that fat as possible. In the leftover beef fat, brown the onion, bell pepper, carrots, and celery. If it seems dry add 1 tbsp of olive oil. Sprinkle with a dash of salt, stir, and cook until onions/carrots begin to soft, about 8 minutes. Add the beef back into the pan with the veggies. Pour in the tomato sauce, green chiles, balsamic vinegar, and all of the spices. Stir to combine and cook another 2-3 minutes. Pour entire mixture into a 9×13 baking dish. 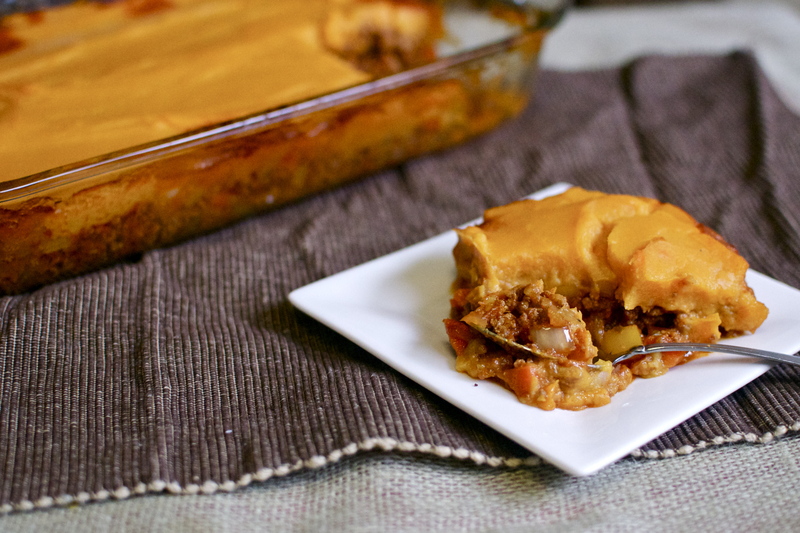 Spread the cauliflower/sweet potato puree on top and bake for 30 minutes. I like to start this right before I brown the meat so that it cooks along side the meat/veggies. In a large pot add cauliflower, sweet potatoes, and 1 cup water. Cover and cook over high heat until it boils, and then reduce heat to medium. Cook about 10-15 minutes until sweet potatoes are very tender. Carefully, transfer sweet potatoes and cauliflower to a blender, doing your best to NOT transfer the cooking water. Blend until smooth. If it seems too thick, add a couple tbsp of the cooking water at a time. Usually, I find the cauliflower gives off enough moisture that extra water isn’t needed. thank you, SOO glad you all enjoyed it !!! Oh man…I’m drooling! Totally trying this! It’s one of our favorites !!! I’m going to try this one while my love is performing in a play. She wants it…she’ll get it. Hopefully. Wish me luck and thank you for this beautiful dish. Now, on with it, right?